WHEN students of Hilotongan Integrated School (HIS) were ushered into the computer lab after a turnover ceremony on Friday morning, Grade 9-Prudence pupil Barbi Villadolid headed to computer unit 7, opened Microsoft Word, and typed 2 words: Thank you. Villadolid expressed on her computer monitor the gratitude the school and the wider island community felt for being the recipient of an off-grid solar power installation by the Vivant Foundation. The foundation, the corporate social responsibility arm of Cebu-based energy company Vivant Corporation, installed solar panels, batteries, and the system that finally allowed the school to use computers that have been idle for lack of power. TURNOVER. Vivant Foundation Executive Director Shem Garcia (center) turns over a solar panel to Hilotongan Integrated School Principal Nelita Cervantes to mark the turnover of the solar power system that now powers the school. The turnover was held at the school last Friday. With them on stage are Vivant Corporation Assistant Vice President Grant Clark (4th from right), DepEd 7 Assistant Regional Director Salustiano Jimenez (4th from left) and other officials from DepEd and the local government unit. The solar power system also allows the school to finally have LED lights and electric fans in its classrooms. Before the system was installed, students took turns using a laptop charged by a generator, said Vivant Foundation Executive Director Shem Garcia. HIS Principal Nelita Cervantes said that to use computers, students used to take a 30 to 45-minute boat ride to Bantayan Island that costs P20 roundtrip and rent computers at an internet cafe by the minute. That is a fortune for students lucky to have P10 as daily allowance, Cervantes said. COMPUTER LAB. Grade 9 student Barbi Villadolid (left) works on her unit during a tour of the computer lab after the turnover ceremony. The solar power installation donated by Vivant Foundation powers this computer lab as well as the lighting and ventilation in all of the school’s classrooms. Now, Villadolid said in an interview, they are able to listen to lectures comfortably in their airconditioned computer lab and use the computers to work on their assignments and projects. From presentations on manila paper, she said, they have started to submit digital reports. “Our school rooms are now well-lighted and well-ventilated because of solar power. Our students can now use computers,” Cervantes said during the turnover ceremony at the school. Hilotongan is an island barangay off Bantayan Island. It is accessible by boat only during high tide. The donation is seen to help the school improve its performance in educational measures, said Department of Education (DepEd) Central Visayas Assistant Regional Director Salustiano Jimenez. He said the facility and the comfort of studying with the electric fans in classrooms and air conditioning in the computer lab will increase the interest and eagerness of students to attend classes. Garcia said the foundation chose HIS because it has the biggest student population, at 734 pupils, among un-energized islet schools in Cebu Province. Juvimar Montolo of DepEd Cebu Province said she is sure academic performance will improve at the school. She said the area performed poorly in science and she sees the donation as helping the school do better on the subject. The solar rooftop panels power the 2 computer processing units and 46 monitors connected to it in the high school computer lab. It also powers the 6 computers in the grade school computer room and the air conditioning for both rooms. The installation also powers the school’s sound system as well as the perimeter lights that secure the campus at night. Vivant also upgraded the school’s electrical wiring. ROOFTOP INSTALLATION. This rooftop installation powers the schools computer lab and the lighting and ventilation in all classrooms. Vivant Foundation made sure the system will function even under cloud cover. “The solar power system includes inverters and batteries that ensure that lighting and appliances continue to function even when there’s cloud cover and that perimeter lights remain on at night,” the company said in a statement. The solar rooftop system is more than enough for the school’s future load, the foundation said. Garcia said the foundation spent over P4 million for the Hilotongan project. The installation, however, is just one component of the Liadlaw Off-Grid Solar Electrification Project. The project is named after Liadlaw, the pre-Christian Visayan god of the sun. The other component, which is unique in the country, is the equipment donation and training of senior high students of Bantayan National High School on solar power installation and maintenance as part of the Electronic Installation and Maintenance (EIM) national certificate. 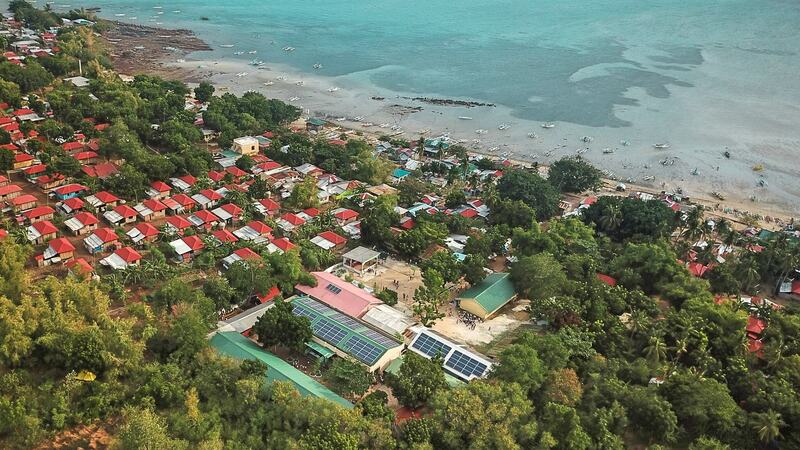 The Bantayan students who will be trained on solar power will then maintain the off-grid installation in Hilotongan. This exchange allows the EIM students to get actual experience on solar power and HIS to have its systems checked regularly and maintained. The donation and new EIM curriculum that incorporates solar power has sparked interest among students in Bantayan National High School. For the first year of EIM, 32 students enrolled in the course. This dropped to 15 the next year when students realized there were no equipment to work with. After Vivant’s donation, enrolment this year shot up to 90. When these students graduate, they will have 2 certifications: for EIM and solar power. BIGGEST POPULATION. Hilotongan Integrated School was chosen as pilot beneficiary because it has the biggest student population among un-energized islet schools in Cebu Province. Apart from maintaining the Hilotongan system, these Bantayan students will be able to work on other solar projects in the area, Garcia said. He said he talked to people who have businesses in Bantayan Island and they told him their hesitation with using solar power is the lack of workers to maintain it. Garcia said the foundation hopes that when the students graduate from the course, they can serve as local workers to maintain installations and encourage businesses to adopt solar power. Garcia said the students will be “a step ahead of other electricians” when solar power use at home and business go up exponentially as it did in China and other developed countries. He said the foundation hopes to work on more schools in the future. HILOTONGAN Island is 30 to 45 minutes by boat from the mainland Bantayan Island.